The book takes place about fifty years after the second, but has significant ties to both of the earlier books that really helps to tie everything into the overall storyline, which I kinda wasn’t expecting, but was a nice touch. Eisenhorn is officiating at a heresy trial when he learns the man who killed his old friend Midas Betancore is on the same world. He sets off with his team in pursuit, but discovers an Imperial Titan waiting for him, and is forced to use some of his more dangerous skills to vanquish the war machine. During the battle, several of his colleagues are injured, so the team retires to Gudrun and Messina in order to recuperate. Unfortunately, a co-ordinated strike against Eisenhorn’s entire organisation is then launched, leading to a massive chase across the planet. Eisenhorn realises that Pontius Glaw, the disembodied cultist from Xenos, is bankrolling the mercenaries who are hunting him down, and teams up with his erstwhile protege Gideon Ravenor to finally put an end to the Chaos worshipper. I have to say, I wasn’t as much of a fan of this book as I was of its predecessor. I think the protracted chase sequence that forms the core of the book, while it has a lot to commend it, felt a bit weird for a Warhammer novel. I mean, it reads a lot more like Murder on the Orient Express, somehow, but I do appreciate how Dan Abnett really fleshes out Gudrun as a planet, with distinct locations and geography. I’ve read so much science fiction where planets are largely one-dimensional entities, whereas here we have a planet that feels like a planet, which was really novel! I can’t write any kind of review of this book without mentioning the body count here. As I said, Pontius Glaw sends mercenaries after Eisenhorn’s entire retinue and, while I thought that Malleus had enlarged the group around him almost unnecessarily, it was still absolutely shocking to see how so many of these people are stripped away from him. However, it doesn’t end with the attack on his estate, and I found myself genuinely distraught when certain folks kicked the bucket! Again, I’m really trying to avoid spoilers, but there are two deaths in particular at the end that I was really upset by! A testament to the writing, right there. I’m really glad I’ve read these books, as they seem to be seminal works from the 40k universe. My enjoyment of them was somewhat uneven, though at their best, these books really are amazing. I love the way Abnett weaves so many elements that we’re used to primarily from a gaming perspective into a genuine cohesive narrative that transcends mere game tie-in material. 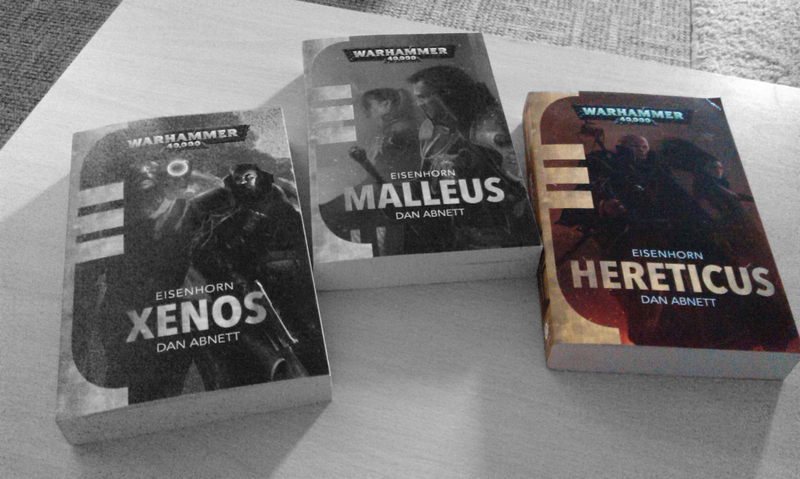 I think I still prefer the Ultramarines novels as the best of 40k novels, but these weren’t half bad overall, either! Next Next post: Genestealer Cult!